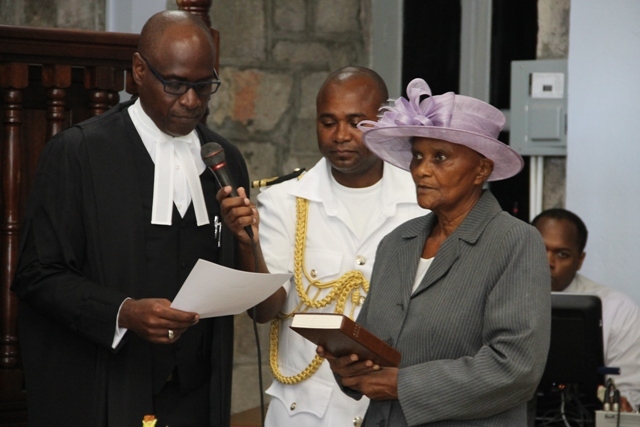 Photo 1: Her Honour Marjorie Morton, the new acting deputy governor-general for Nevis, takes her oath administered by resident High Court judge in St. Kitts, the Hon. Justice Trevor Mills QC, at the High Court in Charlestown Sept. 1. Photo 2: Governor-general of St. Kitts and Nevis, His Excellency Sir S.W. 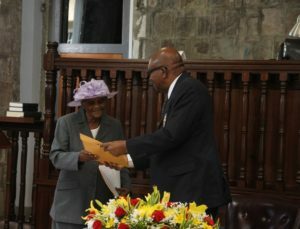 Tapley Seaton, hands over the instruments of office to new Acting Deputy Governor-General Her Honour Marjorie Morton at a swearing-in ceremony at the High Court in Charlestown Sept. 1. CHARLESTOWN, Nevis – Newly sworn-in Acting Deputy Governor-General for Nevis Her Honour Marjorie Morton CSM says she is awed by the honour bestowed on her in a position of trust. Her Honour, who is the first woman to hold the position on Nevis, made the comment moments after Resident High Court Judge in St. Kitts Hon. Justice Trevor Mills QC, administered the Oath of Allegiance and the Oath of Office of Acting Deputy Governor General from Sept. 1-Dec. 31 at a swearing-in ceremony at the High Court in Charlestown. Sept. 1. The event was presided over by Governor-General of St. Kitts and Nevis His Excellency Sir S.W. Tapley Seaton. Morton said some words from the Holy Writ also kept surfacing in her thoughts, egging her to be strong and accept the position. She made it clear that serving in the position is not about her. She noted that she is guided by the thought that whatever she can do for the benefit of mankind, she should not neglect it. She thanked all for their show of confidence in her, giving her the opportunity to perform the duties of deputy governor-general and promised to perform her duties to the best of her ability with God as her helper. Morton also thanked her family for their unwavering support. She also thanked all the people of the land, who in one way or the other offered their congratulations and prayers and to those who will continue to sustain her in their prayers.